Jaqueline Legere, right, takes a leap off the steep, icy slope that leads to the crashed ice course. The Red Bull Crashed Ice course in St. Paul starts atop three stories of scaffolding erected on the front steps of the Minnesota capital's namesake hilltop cathedral. Twelve feet from the chute is a sheer 6-foot drop which leads abruptly into a steep, icy slope. From there, riders hit speeds exceeding 30 miles per hour on the frozen 340-meter downhill obstacle course that snakes over berms, through hairpins and into jumps that finally subside at the flat-surface finish line some 114 feet below. From their perch, Legere and her three fellow riders can see almost none of that. They can only hear the cheers and groans of 100,000 people huddled against sub-freezing temperatures, feel the arena rock and hip-hop shake the metal, wood and ice beneath their blades, and look out onto city's night skyline and the abyss that awaits mere inches in front of them. Legere lives for the jump, the eyes-open leap into the arms of the unknown. Adventure is what drew the Ontario native to the extreme winter sport -- basically a mashup of motocross, speed skating and roller derby -- six years ago. 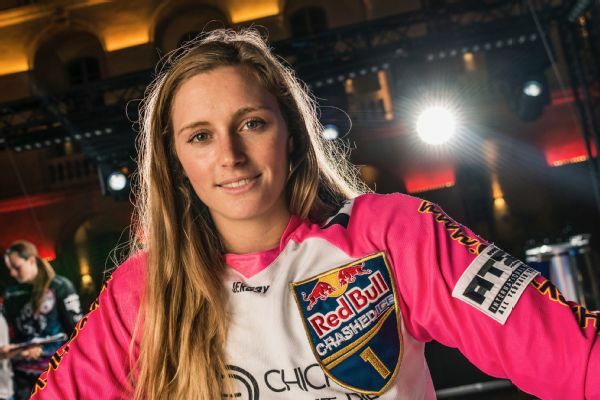 Last year, she won the Red Bull Crashed Ice's first-ever women's world championship at age 24. This season started off perfectly with a win in France. But a fifth-place finish in Finland has her stuck in second place in the standings behind the U.S.'s Amanda Trunzo. With only four races in the championship, she probably needs at least a podium here to stay in striking distance for the final event in Ottawa on Saturday. But this 6-foot St. Paul leap has vexed Legere. She's having trouble landing soundly, losing her footing on the slope and heading unsteadily into a series of rolling bumps where she wiped out during practice a day ago and slipped up again slightly during qualifiers, in which she placed fourth. Hours ago, she managed to stay upright en route to an easy win in the first heat, and she skated clean to win the second heat, but she knows that here in the semifinal, she's going to need more speed to best the stiffer competition and make the final. Legere fidgets in the chute, warming up, working her blades into the brittle ice for grip. When her name is announced over the PA, she holds out her gloved hands as if summoning energy from the unseen crowd's applause. There are two types of people in the world. One, the majority -- many of whom can barely stand in skates -- who would watch a crashed ice race or just gaze upon the twisted ribbon of ice that is a track and say, "That's insane! There's no way!" The other, a select few, would reply, "That's insane! I have to do it!" Legere is undoubtedly the latter. She grew up in St. George, Ontario, a one-stoplight town about an hour outside of Toronto. Like many Northerners, Legere was practically born with skates on, starting with figure skating when she was just a toddler before ditching the toe pick and joining her older brother in playing hockey. She joined youth soccer in the summer. But as she got older, she found that even these fast and physical sports weren't completely satisfying her appetite for excitement. She started skiing, roller blading at skate and bike parks, and trail running in the rugged wilderness around her hometown; then she moved on to wakeboarding, longboarding and dirt-bike racing. 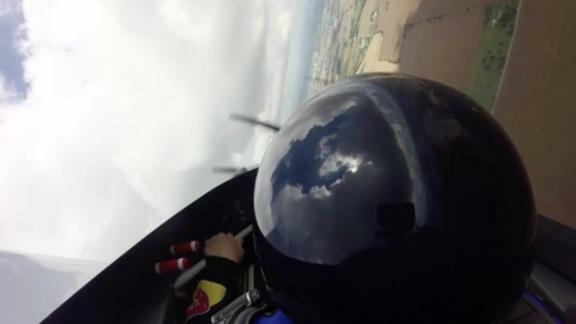 Next came skydiving. "Extreme and high-speed sports definitely draw me in," she says. "I still get nervous -- but that's the rush you get from pushing yourself." Jacqueline Legere, 26, says extreme sports draw her in. "I still get nervous -- but that's the rush you get from pushing yourself," she says. School never quite provided the same type of fix. After high school, Legere went to college for a couple of years to study criminology and train to be a police officer, but she was never really sure what she wanted to do. Then in the summer of 2011, 19-year-old Legere was practicing motocross at a local dirt track when she re-met Brayden Jones, who used to hang out with her older brother. The two dirt-bikers quickly bonded over their common addiction. "It's hard to find a girl who is up for that sort of lifestyle and wants to do that stuff all the time," says Jones, now Legere's boyfriend of six years. "With the previous girls I had dated, I had to choose between hanging out with them at the movies or the mall, or doing what I wanted to do. With Jacqueline, it's like: 'What should we do tonight? Want to go dirt-biking?'" For Jones, thrill-seeking was more than just a hobby. He was a second-generation stuntman. His dad, his mom and all three of his siblings made their livings choreographing and staging action sequences for movies and TV. Stunt work is a relatively small, tight-knit professional community. Not long after Jones and Legere started dating, Jones heard of a job opening for a young woman to double an actress playing soccer on an episode of the TV show "Degrassi." He urged Legere to give it a shot. "They were looking all over Toronto for a girl that was smaller and actually good," Jones says. "She had the right skills and the right look. It was a good fit." Legere's newfound career was a perfect fit. And with Jones' family introduction, Legere was soon in steady work doing things like cliff jumping into water wearing an Elizabethan-era dress for the CW period drama "Reign," taking down a gunman in a fist fight on a BBC crime procedural, or attacking Will Smith and his band of super anti-heroes as one of the black monsters in "Suicide Squad." She has trained in everything from archery to parkour to setting herself on fire and has performed the even harder trick of parlaying this resume into a full-time job. One highlight that Legere splices into her stunt reel is crashed ice, which first appeared on her radar back in 2011, a few months after she met Jones. She saw a YouTube video recruiting extreme athletes to Toronto to try out for Red Bull Crashed Ice's new women's event. Even for men, the sport was in its infancy, having started with one-off races in 2001. A women's competition wasn't added until 2007. There was no formal way to train, no real coaches, no teams, and since the tracks take 12,000 man hours, 4,500 feet of puckboard, 650 sheets of plywood and 25,000 gallons of water to build, there were no places to practice. Even the Toronto tryout was held in a rink, to test speed and agility around barrels and under bars set up on the flat ice. Legere wasn't quite fast enough in Toronto, but undeterred, she showed up for the next tryout the following week in nearby London, Ontario, and made the cut. She says she doesn't remember the details of her first event in winter 2011 at Quebec City -- but she's sure she fell a few times. And since there were only one or two events a year for the women, Legere did the best she could to cobble together a homespun practice regimen. She ran, worked on her core. She hit the downhill skiing jumps and the skate parks. She even strapped on roller blades and started rolling on the treadmill at speed. By 2015, her work was starting to pay off. She placed second in both events in St. Paul and Finland. 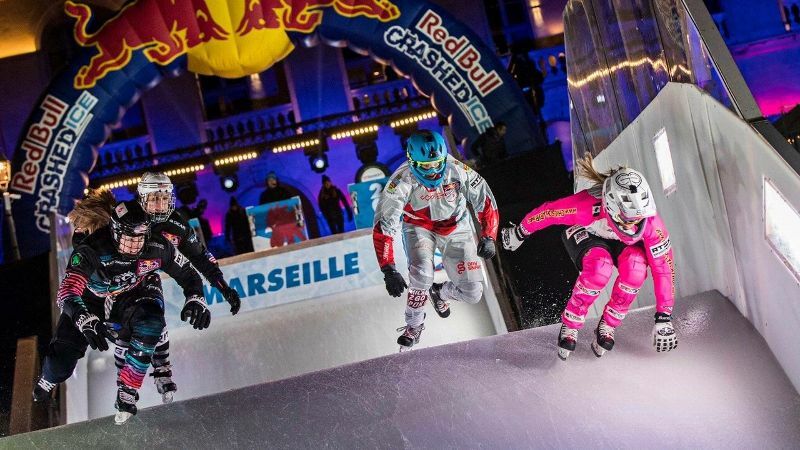 The following year, the first of the Red Bull Crashed Ice Women's Championship series, she cruised with three podium finishes and two wins in four events en route to taking the inaugural title. "She was a natural with her sports pedigree," says John Fisher, who has been skating in the men's circuit since 2009. "One thing you notice is that her balance is significantly better than everyone else's." Fisher says that while both men's and women's sides of the sport were initially dominated by hockey players, Legere was one of the first women to show that it took a more versatile sports and training background -- the balance and agility in addition to the hockey strength and speed -- in order to excel. Legere's experience in coordinating and executing complex stunts gives her an added insight into approaching the obstacles and pitfalls that await her on the ice. And, if necessary, she also knows the proper way to take a fall. People think this sport is crazy, but it's the calmest thing she does -- her life is way gnarlier than what she's doing here. Christian Papillon, Red Bull Crashed Ice sport director and former rider. 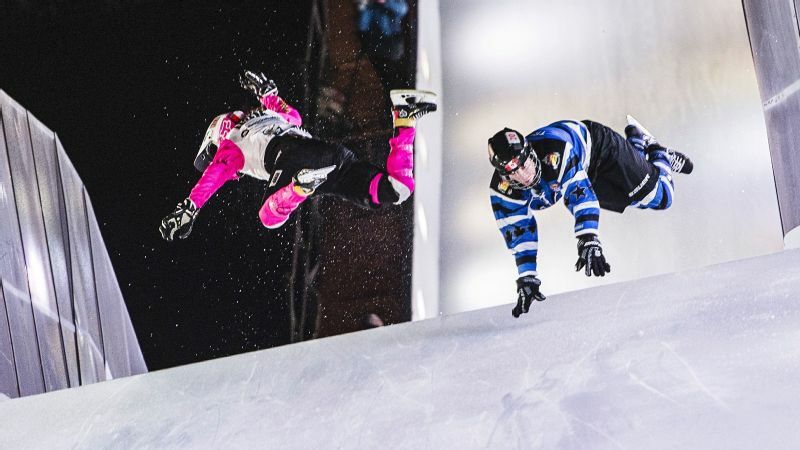 It's almost impossible to follow all of the action during a crashed ice race. At 340 meters long, the relatively narrow track winds and stretches downhill in a way that enables fans to catch only a fleeting glimpse at the riders as they pass, before they must turn to one of the two big screens to see what ensues. And if the four racers spread out, even the camera must leave the stragglers behind to focus on the frontrunners. The fortunate onlookers standing near the start for the women's semifinal heat in St. Paul can see that Legere's leap from the ledge has her out to an immediate lead as she sticks the landing, both skates firm and stable on the icy slope. Smaller and faster than the other three riders in her neon pink jersey, Legere bends to pick up speed and starts to pull away. As she stands to brace for the first roller, her left blade gives way. Her right leg swings forward from underneath her and she falls, momentum skipping her like a stone across the rollers on her rear. But she's so far ahead that she's able to recover and get back on her feet before the others catch up. Accelerating out of the hairpin, Legere leans into compact, powerful strides and she again starts to distance herself from the pack. She speeds out of another turn, off another jump, down a fast hill and onto the straightaway approaching another set of four rollers, choppier than the first. She erects herself and brings her skates side-by-side to meet the first bump and jumps the second without incident. But as she tries to do the same to the next roller, both feet come up from underneath her, both blades in the air, as her upper back, neck and head slam against the ice at speed. A collective moan erupts from the crowd, which quickly recovers to refocus on the other three racers who've managed to dodge the wreck that skids to a stop against the wall. The cameras follow the trio over a bridge, into the corner jump and down the final hill coasting across the finish, where they hug and congratulate each other and slap spectators' hands outstretched over the waist-high wall. The entire celebration is captured on the big screens. Meanwhile, back on the straightaway, just after the second set of rollers, only a few spectators can see that the paramedics have brought a stretcher out onto the ice as they tend to Legere, just a pink heap in the corner of the track. Jacqueline Legere falls during the finals of the second stage of the Ice Cross Downhill World Championship in January 2016 in Munich. Crashed ice is still very much a niche interest -- if it's even that big. As with any other sport, if this extreme winter sport is going to make a real impact in terms of mass media and popular culture, it will need faces and personalities to draw in casual viewers. Legere's success, her movie-star looks (complete with an IMDb profile) and her daredevil stunt-woman image, make her a prime candidate for stardom. "She's got everything it takes to bring attention," says Christian Papillon, Red Bull Crashed Ice sport director and former rider. "Her background is so impressive. She's a stuntwoman. People think this sport is crazy, but it's the calmest thing she does -- her life is way gnarlier than what she's doing here. She's a nice person, good character, good-looking, charming, and her ability brings the women's category to a really high level. She's a real athlete, and she knows how to make the sport exciting." While the Red Bull execs hope Legere's image will help attract more fans, Legere is using her personality to bring more athletes to the track. She's always inviting women to train with her and get involved in the sport. Several of the riders in the rapidly expanding women's field are Legere recruits. Tamara Kajah, a fourth-year competitor, played hockey with Legere back in Ontario. When she expressed interest in Legere's other hobby, Legere encouraged her to tryout and showed her how to train at the skate park. "She's intimidating on the track, but she's so approachable and down-to-earth off of it that you can ask her anything," Kajah says. "She told me that if I thought I would like it, I would definitely like it. The first time I did it, I felt prepared because of her." You push yourself harder training with guys. But sometimes it's nice to have a girls' day to go do something rad. Legere says she wants to get more women involved in all sports, extreme or otherwise. She says that after years of training with just guys, she got tired of being the only woman. She started an organization called Chicks That Rip, which posts YouTube videos of different sports, sets up online networks and communities, and creates awareness for female athletes of all ages who might want to get out and bike, wake board, rock climb or even parasail. "I have a lot of girls coming to me saying, 'I really want to try this. How do I do that?' This is a way to try new things or just have a crew to ride with," she says. "You push yourself harder training with guys," she says. "But sometimes it's nice to have a girls' day to go do something rad." Like the website, crashed ice is really still just a hobby for Legere. And while it would be nice to grow the sport to the point that it could provide a full-time salary and endorsements, she has no delusions of the reality. She's only 26. Whether it's on a movie set or on a downhill track, she can throw her body to the wind for as long as she likes -- but those bones can take only so many landings. The athlete's tent, pitched across the street from the Cathedral of St. Paul, smells like sweat and the mildew from one giant hockey bag that has sat in the locker for three days. Disqualified male riders sit around in various stages of undress, snacking on pizza and drinking beer and watching the tournament results on closed circuit TV. When it's time for the women's final, Legere steps out from behind the black curtain separating the girls' "locker room" from the rest of the tent. Face red, hair up in a ponytail, she pulls on a hoodie over the bag of ice packed against her back and neck. Doctors will later confirm that she sustained a slight concussion and some whiplash in the fall. Legere tries to focus on the flat screen TV at the front of the room, where her rival and current points leader, Trunzo, stands ready in the chute. After her brief scare on the track, Legere waved off the medics and managed to get to her feet. 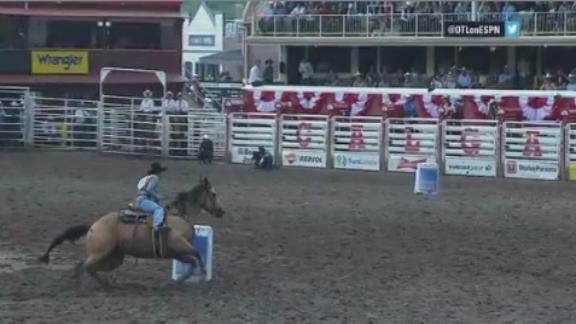 She fell once more, literally pulled herself up the final jump, and slid to the finish on her rear to collect 360 points for seventh place. Still, if Trunzo even reaches the podium, she clinches the title away from the reigning champ. On the screen, the horn sounds. Trunzo starts poorly and is in last place heading into the final straightaway, but the rollers that caught Legere trip up two skaters, allowing Trunzo to move into second with only the final jump to go. Trunzo can hear the shouts of people standing at the finish line where her guaranteed championship awaits when she slips on the jump, falling on her face as the rest of the field glides over and around. She finishes fourth. The skaters in the athletes' tent go wild, throwing tape and paper pizza plates into the air over the dramatic finish. Legere, title hopes suddenly revived, doesn't so much as raise her lip. Blank-faced, she looks down and ducks back into the shadows of the women's dressing area, where she'll nurse her wounds. Her immediate worry is being healthy enough to execute and survive the dirt-bike stunt she's scheduled to do on set two days from now. But part of her mind drifts further into the distance, to the final race in Ottawa, where another jump awaits.